Prices from 8 EURO/ person/night - free after 24.04. -discounts ! 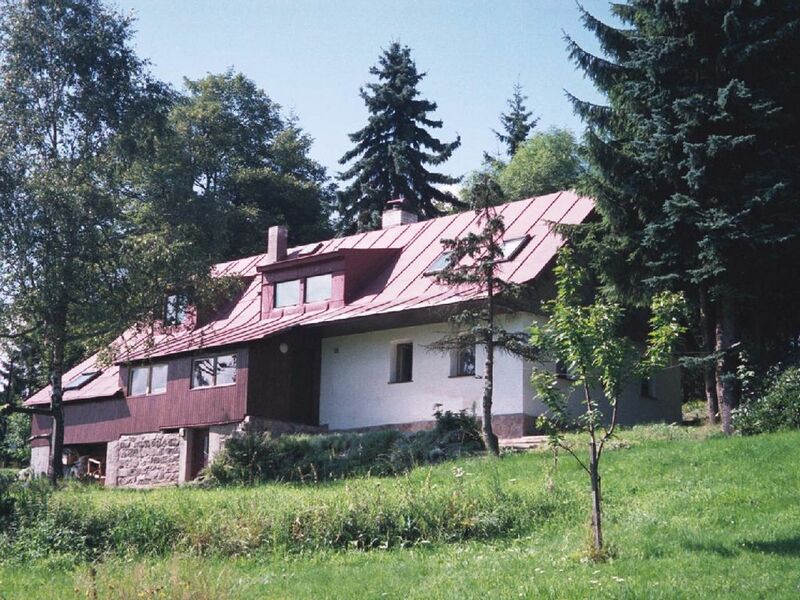 It is very nice holiday flat for till 5 person, beautifully situated in a well-known tourists centre and in winter ski area Bedrichov in Iser Mountains, in North Bohemia, 95 km northerly from the capital city Prague. There are 1 bedroom (double bed and single bed), big living room (double bed), kitchen, SAT-TV, radio/CD, bathroom, toilet. Whole year operating. We have yet 3 nice holiday flats more, for till 20 person. Central heating. Wi-Fi internet free of charge. Big garden, ideal for children, too (garden 3.000 m² with garden furniture, grill and hearth, small pool, brooklet). Car-park free of charge. Restaurant 50 meters. Bathing pools 400 meters and 2.5 km. Tourist's ways and mountain-bike's ways start only 100 meters from us. In the city shops, restaurants, discotheque, bowling, horse riding. Ski tows only 500 meters, operate evenings too. Nice lines for running skis (on the whole 80 km lines). Big covered Aqua park with many water attractions and pleasure centre 7 km, zoo & Botanic Gardens 7 km. In the near surroundings lakes, castles, former glass manufactures. Only 25 km Czech-German border, Prague 95 km. Ideal for your holiday during the whole year: The holiday flats are nice and beautiful situated in the tourist´s centre and in winter ski area in Bedrichov, in Iser Mountains, 100 km northerly from the capital city Prague. Big garden, ideal for children too, (garden 3.000 sq m with garden furniture, grill and hearth). Whole year operating. Car-park. Restaurant 50 metres. Tourist´s ways and mountain-bike´s ways start only 100 meters from us. Bathing pools 400 metres and 2,5km. In the city shops, restaurants, discotheque, bowling, tennis courts, horse riding, in winter ski rentals and ski schools (in english and german language). Ski tows only 500 meters, operating evenings too, snow cannons for snowing up. Nice lines for running skis (on the whole 80 km lines). Big covered aquapark with many water attractions and pleasure centre 7 km, zoo and Botanic Gardens 7 km. In the near surroundings lakes, castles and chateaus, former glass manufacture. We are only 25 km from Czech-German border in Zittau and 25 km from Polish border. Nice trips: The holiday flats are very nice and situated in a beautiful tourist´s centre and in winter ski area Iser Mountains, 100 km northerly from the capital city Prague (highway). Big garden, ideal for children too, (garden 3.000 sq m with garden furniture, grill and hearth). Whole year operating. Car-park. Restaurant 50 metres. Bathing pools 400 meters and 2,5km. In the city shops, restaurants, discotheque, bowling, horse riding, in winter ski rentals and ski schools (in english and german language). Ski tows only 500 metres, operating evenings too, snow cannons for snowing up. Nice lines for running skis (on the whole 80 km lines), touristic ways and mountain-bike ways start only 100 meters from us. Big covered aquapark with many water attractions and pleasure centre 7 km, zoo and Botanic Gardens 7 km. In the near surroundings lakes, castles and chateaus, former glass manufacture. We are only 25 km from Czech-German border in Zittau and 25 km from Polish border. Pick-up and transport from the Prague airport: Pick-up and transport from the Prague airport and to the airport possible. We are only 100 km northerly from capital city Prague and 25 km from Czech-German border and 25 km from Czech-Polish border. Cheap car hire on the Prague airport available (Alimex or Hertz). Busses are running regurarly between Prague and our tourist´s centre Bedrichov. Bathtube with shower, wash basin. Toilet. Linen, towels and dish towels are provided. Wi-fi internet free of charge. Double bed and small sofa. The kitchen unit with microwave, event. cooker, refrigerator with freezing box, glass-ceramic plate, water digester, coffee and tea machine, toaster, and table-ware. Wi-Fi internet free of charge. English and german programs too. We have a large garden of 3.000 sqm with furniture, BBQ and hearth. Small pool. Small brook. Swings. The kitchen unit is equipped with microwave, event. cooker, refrigerator with freezing box, glass-ceramic plate, water digester, coffee and tea machine, toaster, and table-ware. Wi-Fi internet free of charge. Parking at the house. There is a large garden (3.000 sq m), garden furniture - tables and chairs outside, place with grill and hearth. Nice area for children too. Swings, brooklet, small pool. Restaurant 50 meters close. Bedrichov is suitable for hiking or cycling. Touristic ways and mountain-bike ways start only 100 meters from us. Bathing pools 400 meters and 2,5 km. During winter ski tows only 500 meters, operating evenings too, snow cannons for snowing up. Viel schnee und Ruhe, haben uns gut erholt! So nah an der Grenze ist die Tatsache, dass keine Schilder, keine Karten, absolut nichts noch nichtmal ins englische übersetzt wird. Da hat man es als Ausländer ohne Tschechische Sprachkenntnisse nicht einfach. Wer Ruhe und Erholung sucht ist dort aber an der richtigen Stelle. De woning zou geschikt zijn voor senioren/mindervaliden: het appartement dat wij tegewezen kregen was alleen te bereiken via een steile trap. Foto's van het appartement op de website lieten een totaal andere woning zien. Wij hebben onze vakantie afgebroken omdat er geen andere toegankelijke en gezellige woning voor handen was. De eigenaar heeft wel een deel van de huurprijs teruggegeven. Nare ervaring om zo je vakantie in het water te zien vallen. Habe am 14.05.2015 meinen 50.Geburtstag über ein verlängertes Wochenende mit Familie und Freunden in genanntem Ferienhaus verbracht. Wir waren 12 Personen und hatten ausreichend Platz in gemütlich, rustikal eingerichteten 3 Ferienwohnungen. Bei einer größeren Personenzahl ist es sogar möglich ein weiteres Haus anzumieten. Einkaufsmöglichkeit gibt es im Ort, bzw. im schnell erreichbaren Liberec. Für Wanderungen und Ausflüge gibt es viele Touren und Sehenswürdigkeiten in der Umgegend. Im Winter ist ein Skiareal zur Nutzung gleich um die Ecke. Das Ferienhaus steht auf einem sehr großzügigem Grundstück welches gerade für Anlässe wie Feiern oder Familientreffen ideal ist. Sitzmöbel und Grill sind in der Außenanlage genauso vorhanden wie jede Menge Platz zum spielen und toben für die Kinder. Alles in allem ein sehr gelungenes Wochenende mit hervorragendem Preis-Leistungsverhältnis. Die Wohnung war recht einfach ausgestattet, könnte mit einigen Renovierungsmaßnahmen und neuen Möbeln durchaus noch verbessert werden..
Leider war auch der WLAN Empfang ( wohl eher wetterbedingt) nicht sehr gut. Dafür kann der Vermieter jedoch nix. In direkter Nähe gab es Möglichkeiten zum Wandern,. Skilanglauf,- bzw. Abfahrtski. Wir würden das Haus nur bei guter Wetterlage empfehlen, wenn man sich viel draußen aufhält und erst am Abend heimkehrt, ansonsten, war es tagsüber selbst für uns ( 4 Personen) doch etwas eng. Wir waren ein zweites mal in Bedrichov und wurden positiv überrascht, was sich alles geändert hat. Zusätzlich zur immer noch guten Unterkunft wurden im Bereich des Gartens einige Änderungen vorgenommen. Spielgeräte, Rutschen, Schaukeln wurden aufgestellt. Somit ist der Ferienaufenthalt auch für Kinder sehr abwechslungsreich. Uns hat es wieder mal gut gefallen und kommen im Sommer 2014 wieder! um es auf den punkt zu bringen - wir fahren wieder hin preis leistung stimmt!!! Our holiday flats are beautifully situated in a well-known tourists centre and in winter ski area Bedrichov in Iser Mountains, in North Bohemia, 95 km northerly from the capital city Prague. Perfect for your holiday throughout the whole year. Tourism tracks and mountain-bike tracks start only 100 meters from us. In the city shops, restaurants, discotheque, bowling, tennis courts, near horse riding a. s. o. Bathing pools 400 meters and 2,5 km. Ski tows only 500 meters, operating evenings too. Big garden, ideal for children, (garden 3.000 sqm with garden furniture, grill and hearth). Car-park free of charge. Restaurant 50 meters. Tourist´s ways and mountain-bike ways start only 100 meters from us. In the near surroundings lakes, castles and chateaus, former glass manufacture. We are only 95 km northerly from Prague, 25 km from Czech-German border in Zittau and 25 km from Czech-Polish border. We had here already world cups in mountain-bike and running skis. Bedrichov is a known touristic centre in North Bohemia. Touristic ways and mountain-bike ways start only 100 meters from us. In the city shops, restaurants, discotheque, bowling, near horse riding a. s. o. Bathing pools 400 meters and 2,5 km. Ski tows only 500 meters, operating evenings too. Nice lines for running skis (on the whole 80 km lines). Bathing pools 400 meters and 2,5 km. Big covered aquapark with many water attractions and pleasure center 7 km, zoo and Botanic Gardens 7 km. In the near surroundings lakes, castles, former glass manufacture. Golf: 3 golf playgrounds 10 - 20 km from our cottage. Ski: Ski tows only 500 metres, operating evenings too. Nice lines for running skis (on the whole 80 km lines). Ski rentals and ski schools (in english and german language). We had here already world cups in running skis. Preise ab 8 EUR/ Person/ Übernachtung je nach Personenzahl, Urlaubsdauer, Saison und Ferienwohnung. Preise pro Person/Nacht. Preisnachlässe ab dem 24.04. weiter - frei! Bitte fragen Sie unsere Preise an - reduzierte Preise. Belegung mit 2 - 6 Personen möglich. Ideal für Ihren ganzjährigen Urlaub in jeder Jahreszeit. Wir haben auch 3 weitere schöne Ferienwohnungen, gesam für bis 20 Personen. Wir haben immer gute Angebote. Auch ein kürzerer Urlaub als 1 Woche ist möglich. Silvesterpreise auf Anfrage. / Shorter holiday than 1 week is possible too. Occupancy with 2 - 6 person possible. We have 3 nice holiday flats more too, for til 20 person. Prices from 8 EUR/person/night - after 24.04. free - discounts ! Prices for 1 person/night depending on number of person, number of days, season and holiday flat. Silvester prices on request.